We’re getting our weekends back! 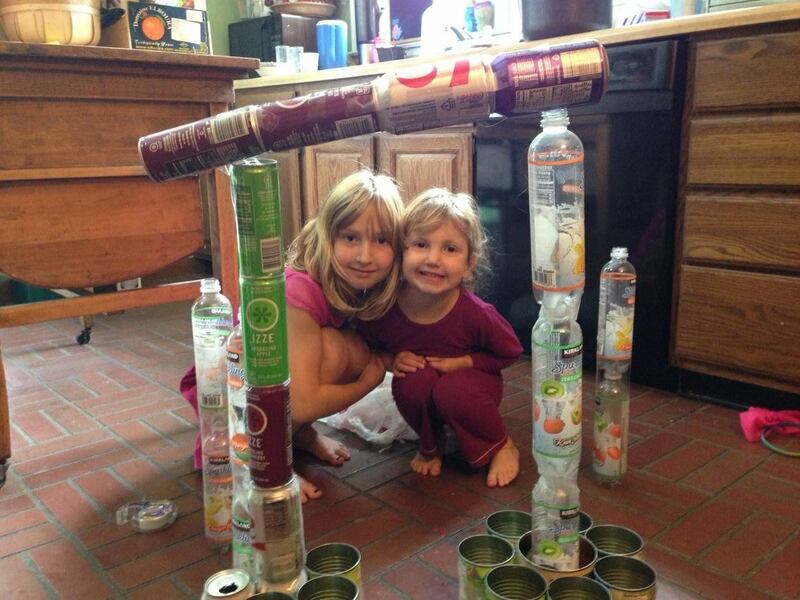 Lily and Neve, posing with one of their patented weekend projects. Remember those times when you were young and exuberantly in love, and could barely keep from announcing your feelings at the top of your lungs at all times? Yes, when they’re too quiet for too long, we have to make sure they’re not giving (more) dolls new haircuts, or painting the cat with blue fingernail polish. But more often than not, they’re doing things like building a project from stuff found in the recycling bin, or playing “indoor beach” (a blue blanket is the water, a brown blanket is the sand), or cutting out and coloring Easter eggs. Meanwhile, Joe and I lounge around in our pajamas until midday, dozing or reading, or doing chores we used to have to do late at night. We make chai tea. We lean against each other on the couch, pointing out the day’s best comics in the paper, or hang out at the kitchen table, chatting. We’re remembering again, in bursts, what it was like to indulge in small pleasures, and why people so look forward to weekends.